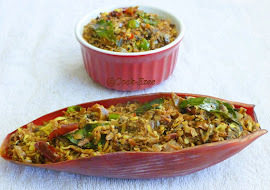 Erissery is a traditional Kerala Dish made with Vanpayar(Red Moong Beans) and any of the Vegetables like Mathanga(Pumpkin) or Yam(Chena) or Pachakkaya(Plantain Banana) cooked in ground coconut and finally seasoned with roasted coconut. You can use any of these vegetables or a combination of veggies as well. I have used the very nutritious Kappakka(Raw Papaya) to make this Erissery which is said to be great for diabetic patients as well. I remember my grandma's backyard with lot of Papaya trees with tremendous amount of papaya on them especially in the monsoon season. The papaya trees are not too strong but fast growing herb and I remember the trees falling off in heavy rain with lot of raw and ripe papayas. When the rain stops my granny and we kids will be picking up all the papayas and my granny use to sound sad when she talks about the fallen papaya trees. But then with-in a couple of months new papaya trees pops up from the seeds of ripe papaya she drops in her backyard and she will be in all smiles again :) It will be all papaya based curries, thoran(Subzi), side dishes then and she makes this raw papaya erissery as well. She does the seasoning either with chopped shallots/onion or with some generous amount of grated coconut roasted and both tastes great. 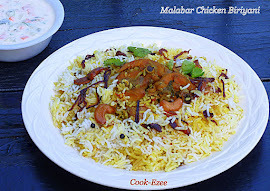 Now that I have given the title as Kannur Style I'm sure you guys guessed it right, yes making of erissery mentioned here is totally different from the typical traditional Kerala Erissery even though few ingredients and process are same and it is still called Erissery in Kannur(Northern Kerala). I remember a friend of mine who is from travancore region scolding me when I said this is our way of making Erissery and I knew very well she couldn't even imagine this to be Erisserry even in her wildest dreams ;) (I still remember her astonished face and I always burst into laugh whenever I remember that). 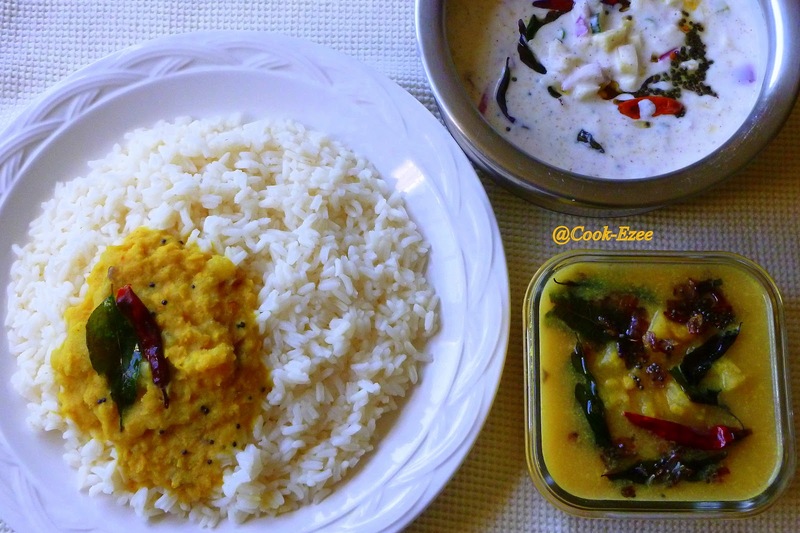 I'm sometimes surprised to see the difference in cooking and flavor of same dishes with in the Kerala cuisine. I will be posting the authentic Kerala Erissery soon but for now here comes the recipe of simple Kannur Style Raw Papaya Erissery. Wash the toor daal and put them in a cooker. 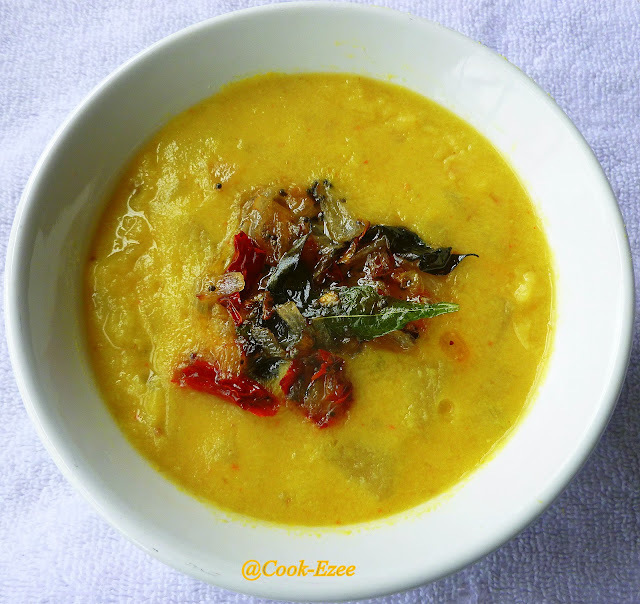 Peel off skin of Raw papaya, wash and cut them into small cubes, add it to the dal. Add turmeric, chilly powder, salt, and water just enough to cover the veggies, stir and mix. Cover and pressure cook for three-four whistles. Switch off the stove and let it cool completely. When the pressure is fully off open the cooker. Put the cooker on the stove, bring the curry to boil. Simmer the heat to medium and let it boil for five-seven minutes stirring in between. Take off the stove. 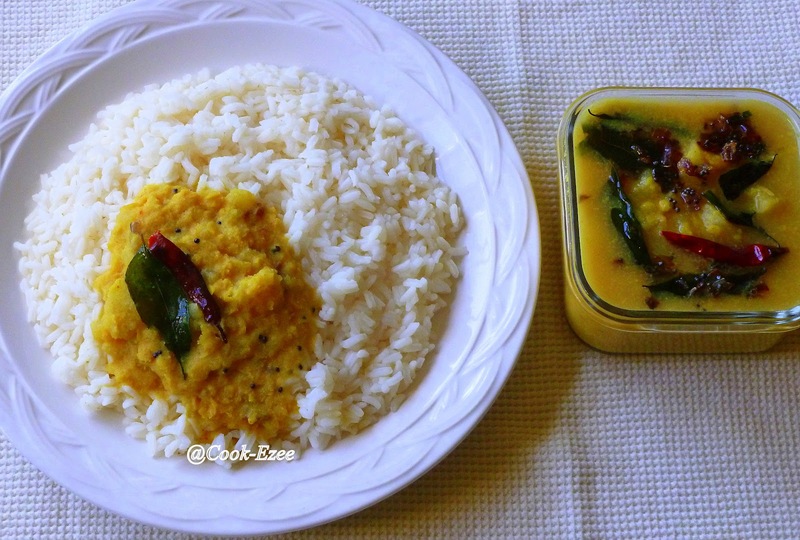 Pour over the prepared curry and serve warm with Rice/Roti. You can use veggies like Yellow Pumpkin, Raw Plantain, Yam etc or a combination of veggies instead of Raw Papaya. I normally coarse grind coconut but you can grind it bit more but this curry don't need coconut to be ground to fine paste compared to normal Kerala curries. Nice version with delicious flavors !! looks wonderful !! There are so many ways to do it right :) This is new to me, we do it differently & am not even sure whether its is close to the original one :D..this is great! 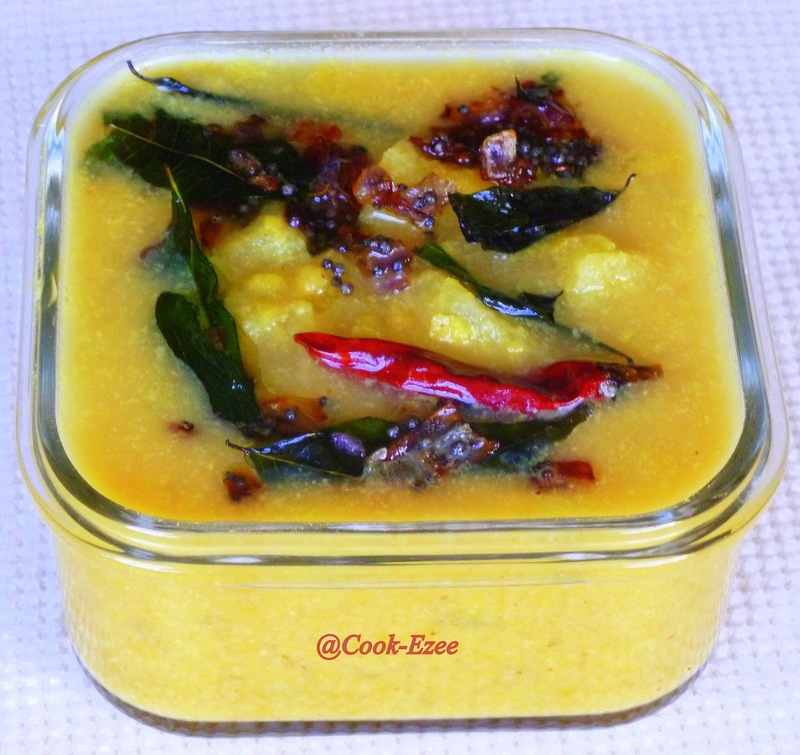 Love papaya based curries,this recipe sounds different..love the color,will surely try it. i love papaya in curries...erissery looks super delicious, our preparation style is different..looks great dear !! Am coming there to have some..
Haven't cooked much with raw papaya, the kootu looks very yummy.. Very New and healthy Eriseri Dear.Awesome n colourful clicks.Yummy! Very New and healthy dish looks awesome.... so cool n colourful clicks. This looks really yummy! Haven't tried erissery with raw papaya! I ve never tried anything like this! SOunds wonderful! this is new to me...sounds so yummy n tempting!! pacha kaplanga kondu erisseri is a wonderful idea! chicken rolls down there are awesome! Hi Prathiba, U have an award waiting for U at my space dear..